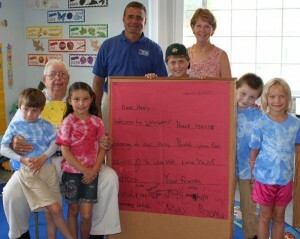 OSWEGO – What began as a little fun between a retired superintendent of schools at Bishop’s Commons and a group of children at Little Lukes has grown into a partnership of correspondence between two parties encouraging reading and writing throughout the summer months and a lesson plan for all ages on the St. Luke Campus. When resident Glenn Clark put his green thumb to work in the garden outside his apartment at Bishop’s Commons, he placed a longtime friend (garden figurine) named “Henry” front and center. Pictured are Bishop’s Commons resident Glenn Clark, Superintendant of OCSD William Crist and OCSD special education teacher Linda Stummer with a few of the students from the Black Penguins Classroom at Little Lukes. At the same time, the children of the Black Penguins classroom at Little Lukes were taking their daily walks along the paths on the St. Luke campus where they made friends with Henry over the summer months. At first, Henry left small gifts for the class that consisted of children with special needs and children attending the school for summer childcare. The gifts led to letters and conversations. The letters led to crossword puzzles and colorful displays of artwork. The correspondence went both ways. With the help of Oswego City School District Special Education Inclusion Classroom Specialist Linda Stummer, the teachers at Little Lukes and “Henry” eager readers and creative writers continued their love of learning throughout out the summer months. “The partnership between Mr. Clark, OSCD and Little Lukes began last summer and has continued to be a wonderful concept and opportunity for everyone once again this year,” noted Julie Chetney, senior living coordinator at Bishop’s Commons. The writing came to a close for the summer when an invitation came from the children inviting Henry to an end of the summer party. Mr. Clark attended the party, representing Henry, at which time gifts, cheers of gratitude and excitement ensued.